I admit it. I have a baked egg problem. I’ll crack an egg into just about anything and try to bake it, if you give me the chance. 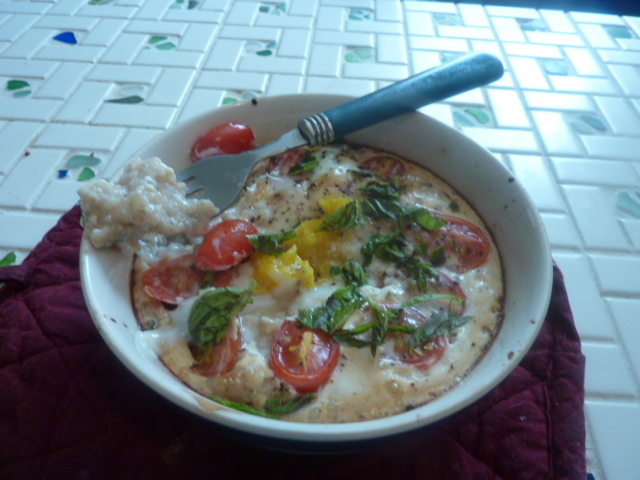 As is obvious, if you look at my baked egg history, my favorite combination is a baked egg with tomatoes, as is represented below in this hearty and filling savory baked oatmeal and egg, replete with some tomatoes and basil. I’m also a huge fan of any sort of savory oatmeal. So, one day after coming home from class in the late morning, ravenous but not quite in the mood for lunch, I decided to concoct this breakfast. I could not have been any happier with the end result. The oatmeal absorbed the juices from the tomatoes as well as the flavors of the basil and egg while maintaining the rich umami of soy and fish sauce. And creamy baked eggs worked beautifully with the soft oatmeal. I am really looking forward to experimenting with variations on this in the future, hopefully including a sweet application. In a small saucepan, add water and oats. Set heat to medium. Bring to a boil and let simmer vigorously about 5 minutes, until creamy and mostly cooked through. Add 1 tsp. soy sauce, fish sauce, and freshly cracked black pepper. Pour carefully into an oven safe bowl. Use a spoon to create an even layer. Spoon plain Greek yogurt over the oatmeal and spread into a single layer. Place tomatoes, cut side up, in a ring around the outside of the bowl. Use a spoon to create a depression in the center of the tomatoes. Carefully crack the egg into the depression. Transfer to oven and bake 15-18 minutes until desired consistency. Since discovering the concept of savory oatmeal, I’ve mostly stuck to the fairly straightforward and simple savory sesame-soy version, mostly because it’s incredibly easy to pack for work. This version, with some adobo sauce, tomatoes, and a soft boiled egg, was a little more involved. Still, it came together in under fifteen minutes and was incredibly easy. It was also unbelievably tasty – slightly smokey and spicy from the adobo sauce, a burst of freshness from the tomato, and the creamy deliciousness of the oatmeal and egg was a spot on combination that I absolutely could not get enough of. Bring chicken stock to a boil in a medium saucepan. Add oatmeal and cook, stirring frequently, 4-5 minutes. Once cooked, keep covered and warm over very low heat. Once seven minutes have passed, carefully transfer the egg to an ice bath. Let sit about a minute, and then peel under running water. Mix together oatmeal, adobo sauce, garlic powder, and tomato. Season with kosher salt and freshly cracked pepper to taste. 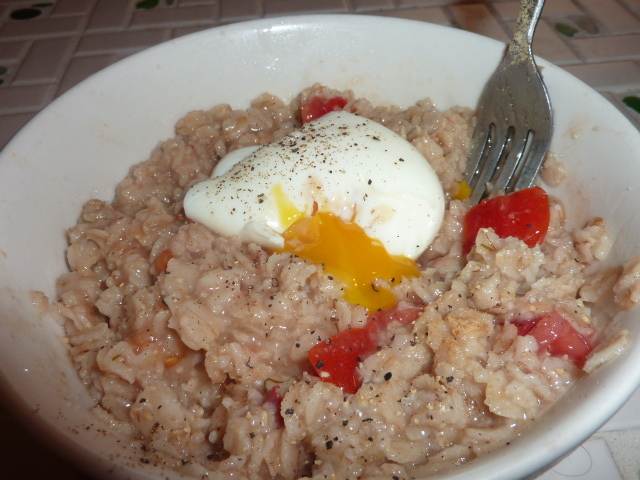 Top oatmeal with soft boiled egg. I’m generally not much of a breakfast person. While I enjoy a nice hearty breakfast on the weekends, it tends to take me awhile to work up an appetite – and I am certainly not going to wake up extra-early just so I can sit there waiting around until I’m ready to eat breakfast. I love to eat, but I really, really love to sleep. So I decided to start bringing a quick and easy breakfast to work, at least some days. While homemade granola bars or a piece of fruit are both viable options, I decided to add oatmeal to the rotation. However, I don’t have much of a sweet tooth. A little Google-ing later, I decided upon the savory sesame-soy oatmeal below. While savory oatmeal might sound a little strange at first glance, this was absolutely delicious. It takes three minutes in the microwave and is warm, comforting, and packed with flavor. I packed the oats in a container large enough to microwave and the soy, sesame oil, and spices in a small spill-proof container. I didn’t bother posting a picture. I’ve tried to take pictures of this dish on a few separate occasions and they always look terrible. I know you all have wonderfully vivid culinary minds and can picture a nice bowl of yummy, delicious, savory, salty, umami-rich, monochromatic and totally boring-looking oatmeal. Place oats and water in a microwave-safe container. Microwave 2-3 minutes, or according to oat package instructions, until water is absorbed and oats and tender. Watch carefully to make sure it doesn’t bubble over (I made this mistake the first time and got to clean out the office microwave – fun!). Stir in soy sauce, sesame oil, crushed red pepper flakes, and black pepper. Serve hot. Alternatively, you can simmer the water and oatmeal in a small saucepan for 5-6 minutes over medium heat until oatmeal is tender and most of liquid has evaporated. Then, stir is soy sauce, sesame oil, crushed red pepper flakes, and black pepper.